Park Hyatt Seoul - FiliVino! The first stop on our around the world trip was a multiple week jaunt around Seoul. 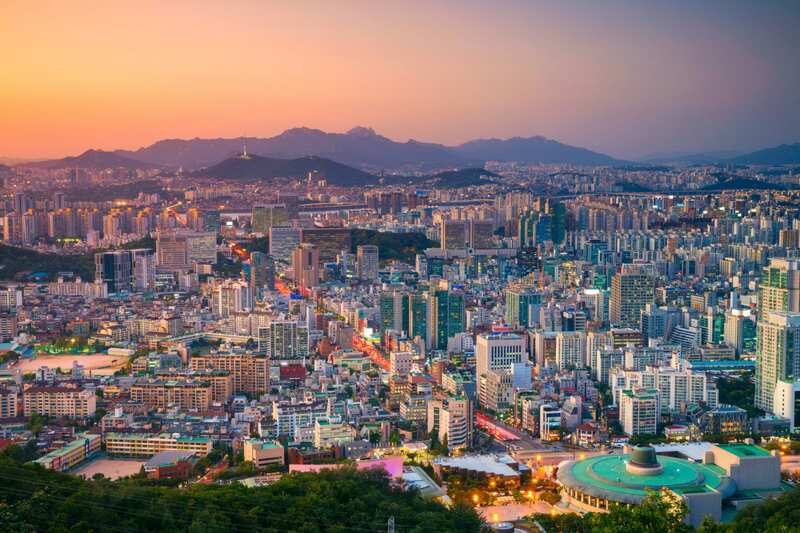 We had previously visited South Korea, but this time wanted to take more time to explore the sights of Seoul and be able to kick back and relax a bit more, rather than rush from one part of the country to the next. So to give a little more insight from our Seoul guide, we’ll drill down a little more to some specific parts. The first hotel we visited was the Park Hyatt Seoul. In the past we have tried to stay in Hyatts as much as possible since they’re generally dependable and you know what to expect. But there are a few turds in the bunch and we have stayed at those as well and they’ve made us question our decisions. We also have the Chase Hyatt (affiliate shill – but only because we actually use and believe in it!) which gives us 3x bonus points for our Hyatt stays, and a free night every year (my wife and I each have one, so TWO free nights!). And right now they’re offering a 40,000 bonus point sign up which is worth a few free nights on its own. We arranged for the hotel to come pick us up from the airport since we knew we’d be tired from the long flight and wanted to deal with as little fuss as possible. They even made arrangements for a child seat in the car. And car seats aren’t a huge thing in Korea so they really went out of their way for that one. The driver was a bit of an unfriendly grump- a stark contrast to 99% of the people we met in the country – but he delivered us in style in a very comfortable Mercedes sedan. So since we were traveling with a kid, we were looking for things that were kid friendly. The Park Hyatt isn’t what we would consider a family hotel, it’s very much business minded. However, they did some things that were VERY kid friendly that no other hotel has done for us in all of our travels. But first – check-in. This was the oddest thing about the hotel, and something I’ve never seen before. The lobby for the hotel is located on the top floor. Seriously. You come into the bottom floor, get on the elevator, go all the way up and THEN you can see the front desk. After checking in and getting to the room, they had left a variety of kiddie friendly items! And not just one or two things, either! A Park Hyatt Seoul Teddy Bear T-Shirt, a stuffed lamb, Teddy Bear Cookies, and kid-friendly bath items and a rubber ducky! Needless to say we were immediately impressed and they had us on the hook. And we were only staying for two nights! The room itself was quite stylish and modern. We had a corner location with lots of glass overlooking the area. This gave our little Flying Lad a birds-eye view of all the city buses coming and going that looked lie Tayo, Rogi, Cito, and all of their pals. The glass enclosed bath and shower area might be a no-go for families with more shy kids, or people who don’t want their roomies seeing them bathe. Speaking of the bathroom, the first thing Flying Lad wanted to do was make a phone call from the phone next to the toilet. That apple you see with the cookies? They brought fresh fruit every day we were there. Even if you’re not one for working out while on vacation, I highly recommend making use of their facilities. It’s the sort of place that provides all of your work out gear for you and then provides lots of high quality products to help you primp and look your best after your workout/sauna time. The Park Hyatt staff was immensely helpful with getting us to our destinations, calling cabs, providing insight on the area, and being generally friendly and responsive. The hotel is very well located to a shopping center across the street that house the Pororo café which was a ton of fun for the kid, and is recommended for anyone with small kids traveling the area. There was also a Korean craft beer festival going on one evening. Yes, Korean craft beer! All in all, would we stay there again? We definitely would! The modern luxury of the Park Hyatt Seoul hotel matches very well with the business traveler, but they sold us on the super family friendly perks. If you can make our kids happy, then we’ll likely follow suit!